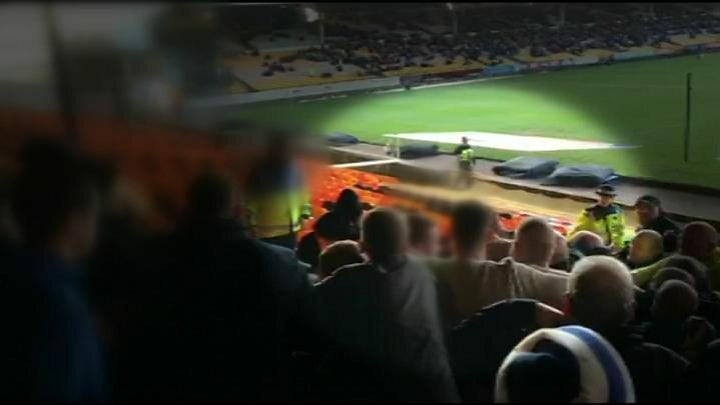 An investigation is being called for into the conduct of police and stewards at a Port Vale v Bristol Rovers match. Four people were arrested following reports of pepper spray being used and supporters getting punched and pushed to the ground. Staffordshire Police said the arrested quartet included a matchday official for "assault of an away fan". Bristol Rovers chairman Steve Hamer is calling on Port Vale Football Club to investigate what happened on Saturday. Violence broke out in the away end stands at Vale Park after a row over a lack of seating escalated. By the 60th minute of the match, which ended in a 1-1 draw, Staffordshire Police said six Bristol Rovers fans had "sustained minor injuries" and 30 had been ejected from the ground. A force spokesman said as well as the matchday official, a 52-year-old man was detained on suspicion of assaulting a police officer, a 23-year-old man was arrested on suspicion of assaulting an official and a 52-year-old man was detained for racially aggravated abuse. All have since been bailed. Andy Williams, a Rovers fan who has multiple sclerosis, said: "I came out of the ground and a policeman swung this person around and hit me in the chest and I went down and cracked my head open on the concrete." Rovers chairman, Mr Hamer said he was "just appalled" and is calling for a full investigation. "You don't go on a Saturday to watch a game of football and support your team and end up being pushed to the floor and punched and pepper sprayed - it's something you never want to hear," he said. "We'll do our damnedest to make sure it never happens again." Rovers said it was not in a position to register an official complaint to police as the trouble happened at Port Vale's ground. A spokesman said the club had been "inundated" with eyewitness accounts which they have forwarded to Port Vale and Avon and Somerset Police. Port Vale have been contacted for comment but have yet to respond.